8.2 Does age make a difference? 8.3 Does Spaying/Neutering make a difference? 8.4 What types of litter should I use? 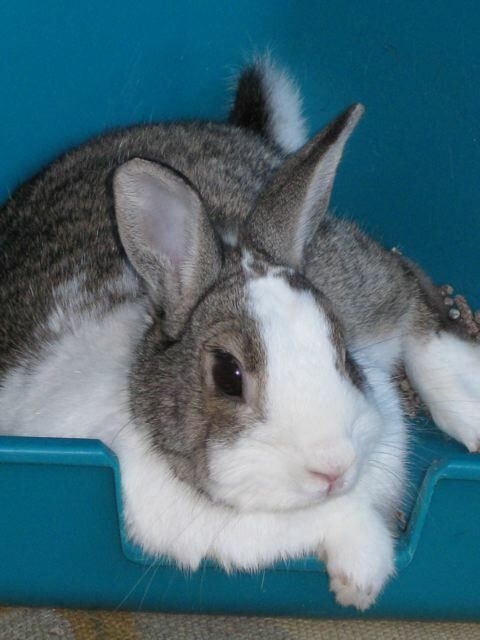 House Rabbit Society recommends organic litters, made from alfalfa, oat, citrus or paper. (Some brands to look for: Care Fresh, Cat Country, Critter Country, Yesterday's News, and Papurr) For a complete listing of litter types, see the litter boxes and liver disease article. corn cob litter isn't absorbent and doesn't control odor, and has the the risk of being eaten and casing a lethal blockage. or by calling 1-800-242-2287. A similar litter in a pelleted form is called Cellu-Dri 1-800-382-5001. These litters are harmless if ingested. Compressed sawdust pellets: are inexpensive, highly absorbent litters used in many foster homes. They are made from softwood or hardwood sawdust, but they are not toxic because the phenolic compounds are removed during their manufacture. Their wood composition helps control bacterial growth and odors. Wood stove fuel pellets and Feline Pine are two examples of this product. 8.6 What kinds of cages work best? Use a cage large enough to contain a small litterbox (along with bunny's food and water bows, toys, etc.) and still allow enough room for the rabbit to stretch out. Place the box in the corner of the cage that he goes in. With a litterbox in the cage, when the rabbit is confined to his cage when you're not home, cage time is learning time. 8.7 What if my cage is on legs or has a door that opens on top so the bunny can't get into it on his own? 8.8 What if my cage is too small for a litter box or I don't use a cage? You may have a cage with wire on the bottom and a tray underneath that catches the urine. In this case, the tray is the litter box and the cage itself is where the bunny learns to go. You can often place the litter box in the tray, under the cage, so that you need not fill the entire bottom with litter. P> If you don't use a cage, you need to give the bunny a particular area to call its own. Just put a litter box wherever the bunny seems to prefer. It's a bit like a child going home and closing the door, because someone is calling her names. They may make the playground an unpleasant place for her, but they can't bother her in her own home. 8.10 Can the rabbit have a running space? 8.11 So what's the actual method? Start with a box in the cage, and one or more boxes in the rabbit's running space. If she urinates in a corner of the cage not containing the box, move the box to that corner until she gets it right. Don't be concerned if your bunny curls up in his litterbox--this is natural. Once she's using the box in the cage, open her door and allow her into her running space. Watch her go in and out on her own. If she heads to a corner where there's no box, or lifts up her tail in the characteristic fashion, cry "no" in a single, sharp burst of sound. Gently herd her back to her cage and her litterbox, or into one of the boxes in her room. Be careful, however. You don't want to make the cage or the litterbox seem like punishment. A handful of hay in the box makes it a more welcoming place. After she first uses the box, praise her and give her her favorite treat. Once she uses the box in her room a couple of times, you're well on your way, as her habits will be on their way to forming. As she gets better trained in her first room, you can increase her space. Don't hurry this process. And if the area becomes very big, or includes a second floor, be sure to include more litterboxes, so as not to confuse her. Remember, as she becomes more confident and uses fewer boxes, you can start to remove some of her early, "training" boxes. Get your rabbit into a daily routine and try not to vary it. Rabbits are very habitual and once a routine is established, they usually prefer to stick with it. A second problem is that rabbits often back up so far in the litterbox that the urine goes over the edge. Again, a covered litterbox can solve this problem. Another solution would be to get a dishpan or other type of tub with much higher sides. Still another solution would be to get a "urine guard" to place around the back of the cage, to keep the litter from spraying outside of the cage. 8.15 What to do if your rabbit insists on using another spot? 8.16 What are the most common litter training mistakes? 8.17 What should I do if my rabbit starts dribbling all over her cage instead of using the litter box? If the "dribbles" are more than dribbles, or if the antibiotic doesn't stop the problem, consider any factors that may be making your bunny feel insecure (new pet, house guests, change in location of cage, etc. ), any of which can cause a bunny to mark her cage more enthusiastically (similar to someone having a dispute with a neighbor about the location of a fence setting up a flag at the property boundary marker). 8.18 Why does my rabbit urinate or leave pills right beside the litterbox? Urinary Tract infections; sludge in the bladder; bladder stones; kidney disease. This should be treated by a qualified doctor. A common example is Oreo, a 8.5 year Dutch who had 75% kidney failure and began urinating on the floor next to the litterbox when her problems first began. Hershey (her mate) did the same thing when he had a severe UTI last year. After the UTI was cleared up, he began to use the litterbox again. Miz bun eliminates next to her litterbox because of some stress, eg, a break in her routine such as less or more running time than usual, visitors at home, kids home from college or summer camp, any intensely emotional event whether good or bad. it could even be a single incident such as being frightened by a sudden noise (car backfiring, etc) while she's in her box, which she then associates with being in the box. whatever the reason, she's feeling insecure and tries to rebuild her confidence by "underlining her signature" (signature being her droppings in the box; underlining, the puddles/piles beside it). Unless it's an ongoing stress that can be removed, figuring out the cause is not particularly relevant. the important factor is not what happened the first time but the habit that often grows from it. she pees beside the box today because she did it yesterday. many people do not take action for the first few incidents, especially with a rabbit who's always been good about using the litterbox. they figure it's a fluke that will disappear as suddenly as it started. this gives the habit time to take firm root. by day 3, the habit is fairly entrenched, and correction of the perceived cause will not solve the problem. What WILL solve it? the usual: confinement, praise, rewards, vigilant observation and supervision during free-run time. but there's a catch-22 to this method. it generally requires a change in miz bun's routine, which is a common cause for the behavior in the first place. i know of no easy way around this knot. the hard way is to confine, praise, etc with minimal change to her usual routine. sometimes i add a box to the rabbit's area. the novelty makes the box attractive (as do treats placed in it). she hops in to investigate, and voila! she eliminates IN A BOX. this is good behavior, worthy of lavish rewards. it's often easier to get her to go in a new box than to go in the one she's been eliminating next to. It's important for people to understand that this process can take time. A rabbit who's been perfectly box-trained for 3 years and has peed next to the box for 3 days may need 3 weeks of intensive training to get back to her old, good behavior. why is it that bad habits take longer to undo than to initiate while the reverse is true of good habits? Winston, a religious litterbox user began urinating on the floor next to the litterbox near the gate...when Buttercup arrived on the opposite side of the gate. After Winston got used to Buttercup, and had "his" territory sufficiently marked, he stopped using the floor and resumed using the litterbox.